Over 100 years ago, the Musashi Plain was a rural area, famous for romantic nocturnal stories. It was also said to be haunted by magical foxes that assembled together, particularly around the new year. 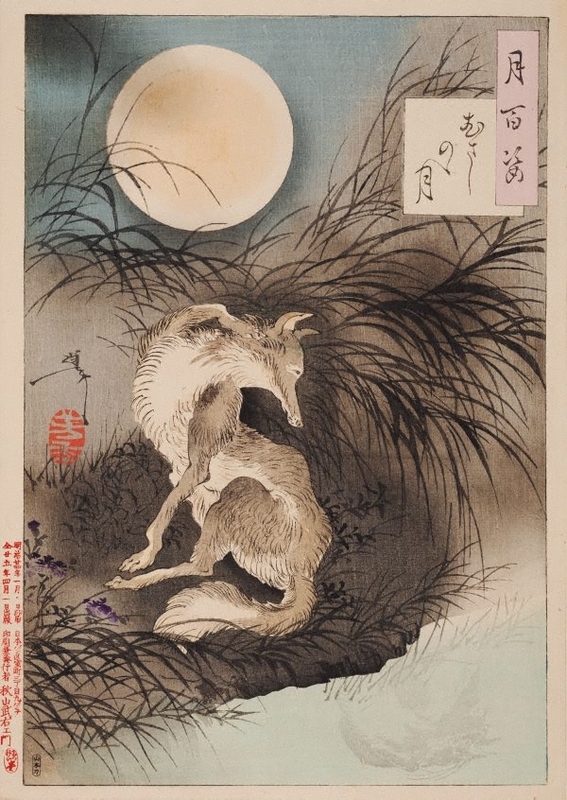 Foxes are important in Japanese legend, and associated with the Shinto spirit Inari, god of the rice harvest or charlatans who played jokes on people. They could take human form, for example take on the appearance of a priest or a beautiful woman. Here, the female vixen is about to turn into a woman, and grooms herself while looking at her moonlit reflection. Natalie Seiz, Look , 'Lunar orbit', pgs.24-28, Sydney, Aug 2016, 28 (colour illus. ).